Acura has loaded the ILX with more standard equipment for 2014 just in case you didn’t believe it was a luxury sport sedan, including bigger wheels, leather upholstery, and power and heated front seats. New, standard 17-inch wheels set the tone for the aggressively-styled 2014 Acura ILX. The sculpted exterior lines and unmistakable Acura front fascia deliver a unique combination of track-inspired athleticism and luxury sedan elegance. 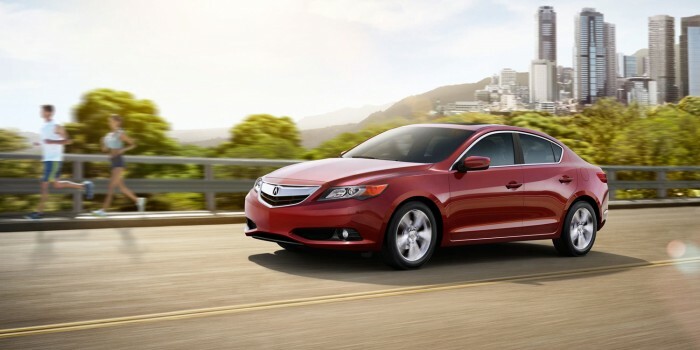 The 2014 Acura ILX boasts two versatile powertrain offerings. The first is a 2.0-liter four-cylinder the produces 150 horsepower and 140 lb-ft of torque. Drivers who opt for the 2014 Acura ILX premium package will boost those figures to 201 horsepower and 170 lb-ft of torque thanks to a 2.4-liter four-cylinder engine that propels the ILX from 0-60 mph in 7.1 seconds. Fuel economy doesn’t get much better in luxury sport sedans than the 2014 Acura ILX’s base 2.0-liter which returns 24 mpg city and 35 mpg highway. The performance-upgraded 2.4-liter still returns 22 mpg city and 31 mpg highway. Materials in the 2014 Acura ILX’s cabin are on-par with the luxury segment, and “if you’re looking for high-tech features, the ILX definitely delivers,” according to Edmunds.com. Available features include a six-inch screen, navigation, voice command functionality, active noise cancellation, dual-zone automatic climate control, and a 10-speaker surround-sound system. Standard safety features in the 2014 Acura ILX include traction and stability control, antilock brakes, and a comprehensive suite of airbags, which allowed the ILX to earn five stars in government crash testing.